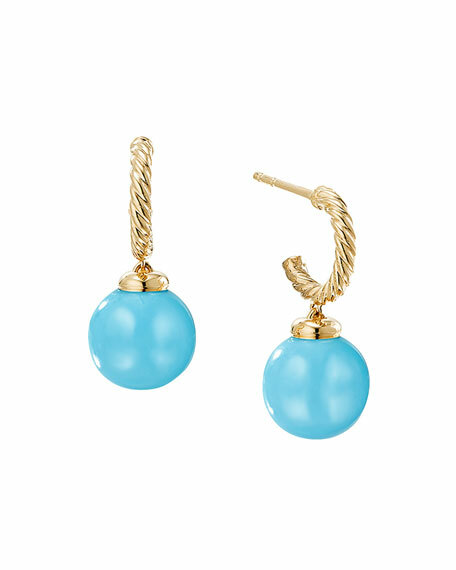 David Yurman earrings from the Solari Collection. Twisted 18-karat yellow gold stems. Round turquoise cabochon drop, 99.5mm. David Yurman Cablespira Hoop Earrings, 2"
David Yurman hoop earrings from the Cable Collection. Polished sterling silver cable hoops. Post backs for pierced ears. Approx. 2"
David Yurman hoop earrings from the Cable Collection. Polished sterling silver cable hoops. Post backs for pierced ears. Approx. 2" diameter. Made in USA.